I’m a breakfast person. Maybe it’s because I’m not a morning person, and it gives me a motive to get out of bed when I’m tangled up in dream webs and sheets. Or maybe it’s a metabolic, blood sugar thing. And for two to three years (I’m really bad at time, I don’t know which) I ate exactly the same thing. Every morning. Granola + yogurt + fruit. Coffee. I found it to be the perfect breakfast to sate my hunger and keep me from consuming copious amounts of baked good throughout my recipe testing fraught days. One day I was asked for a granola recipe. So, like any normal person, I spent about half a day doing granola research to come up with my personal granola ideal. The clutch thing was it had to be clumpy. Granola without clumps is muesli as far as I’m concerned, and I got no time for that. Then one day I thought to add Lindt CLASSIC RECIPE White Chocolate and breakfast was complete. The flavor combination of white chocolate with dried cherries, big flakes of coconut, macadamia nuts, and bee pollen is just just. Just make it. So here are my clumpy granola secrets gleaned from much testing & google fueled research. 1. A mix of wet and dry sweetener. Some form of granulated sugar, be it white, brown, sucanet, or otherwise. And some form of “wet sugar” like honey, sorghum, maple syrup, molasses, golden syrup, what have you. I used to use agave but I’ve since read some not so hot things about it and have removed it from my pantry pending further investigation. 2. A mix of oat flour, rice puffs, and rolled oats = maximum clumpage. Do not use quick oats in place of the rolled oats. Or you will have a sort of granola cookie. Which is nice tasting but not granola. 3. Egg white. While this can absolutely be made sans egg white if you are vegan, it acts as an excellent binder. Resulting in premium clumps. 4. Careful turning and minimum fussage. I turn my granola once during baking with a very, very large spatula (a giant red, plastic one designed for pancakes… very ugly but highly practical). I flip it in pieces as large as I can manage. And there you have it. Granola worthy of, in my opinion, the name granola. Then comes the adding of the stuff & things. This might be my favorite combination of stuff & things. As I’ve said before, I was a very vocal detractor of white chocolate & general hating hater of it…until I met Lindt LINDOR white chocolate truffles which acted as a gateway to the rest of their white chocolate. I’ve been hooked since. 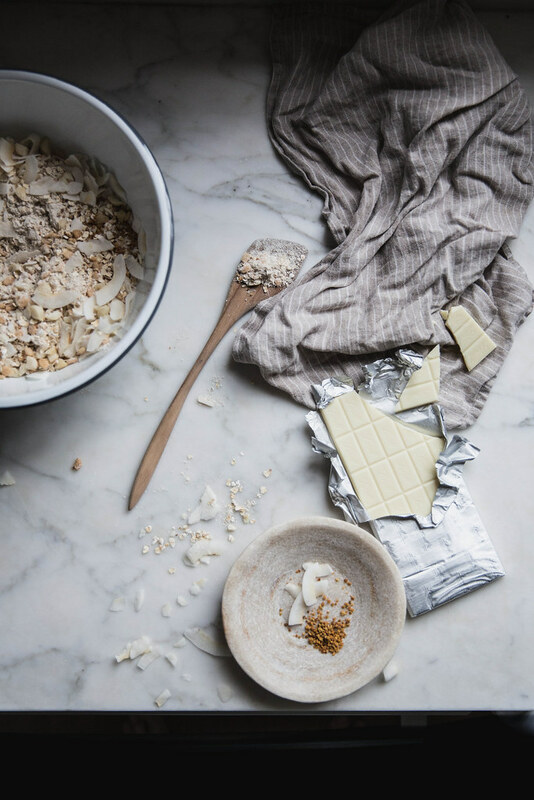 And will admit to making this granola and proceeding to eating all the white chocolate out of it forcing me to replenish it. Oops. This is my Sunday morning indulgence granola, and while I don’t consume it every single morning like I used to, granola is still in heavy rotation. My favorite yogurt to top it with is Icelandic skyr. 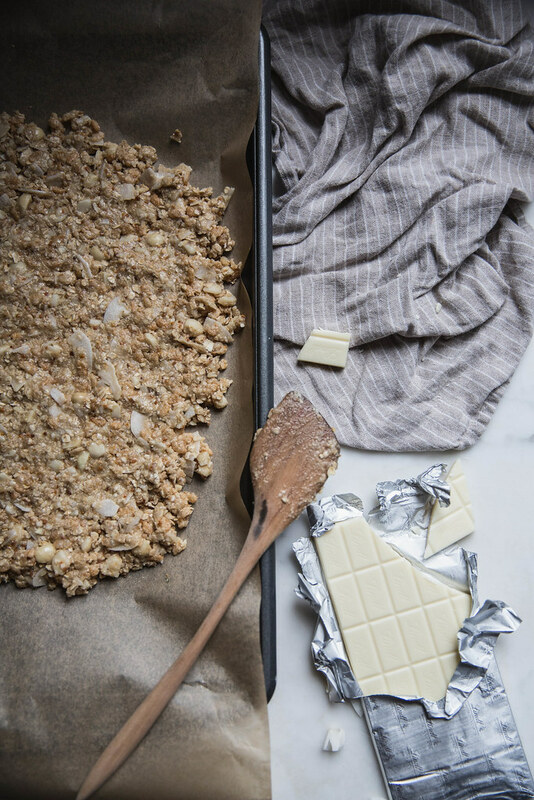 That stuff is protein packed, low in sugar, and the perfect compliment to this sweet granola. Though it isn’t too sweet. Just sweet enough. Heat oven to 300°F, and line a sheet tray with parchment paper. 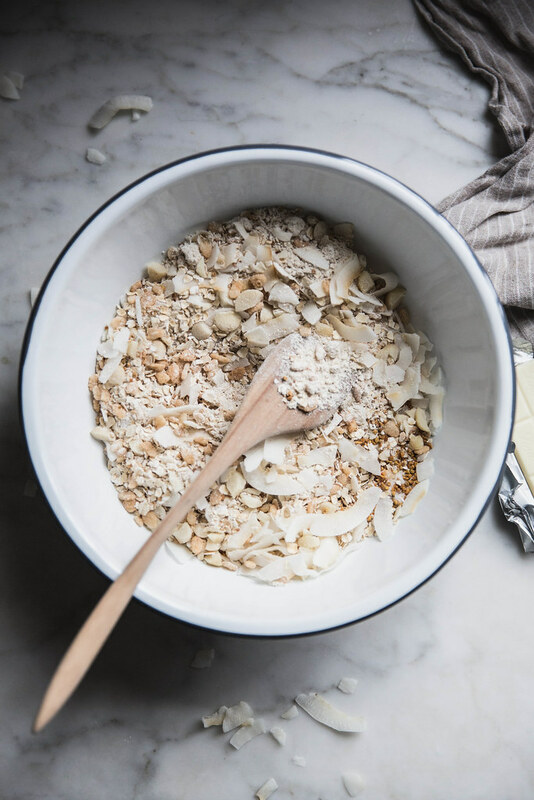 In a mixing bowl thoroughly combine the bee pollen, coconut flakes, rolled oats, oat flour, rice puffs, salt, sugar, and nuts. In a separate bowl thoroughly combine the honey, coconut oil, and egg white. Pour the wet ingredients into the bowl of dry ingredients and stire (or work with your hands) until thoroughly combined & all the dry ingredients are wet. Pat the granola onto the sheet tray in one solid mass, a single layer, about 3/4 inch thick. Bake for 20-25 minutes until the edges start to turn golden. Remove from the oven, flip the granola, and bake for an additional 20 minutes or until it's just golden brown. Allow granola to cool fully (it will come out chewy but crisp up when it's room temp), and then break it up into desired size clumps. Gently mix in the cherries and white chocolate and store in an airtight container. This looks heavenly – thanks for sharing! The addition of white chocolate is genius. I’d never thought to use egg white as a binder, I love that idea to make it more “chunky” – and I really love the coconut cherry combo! 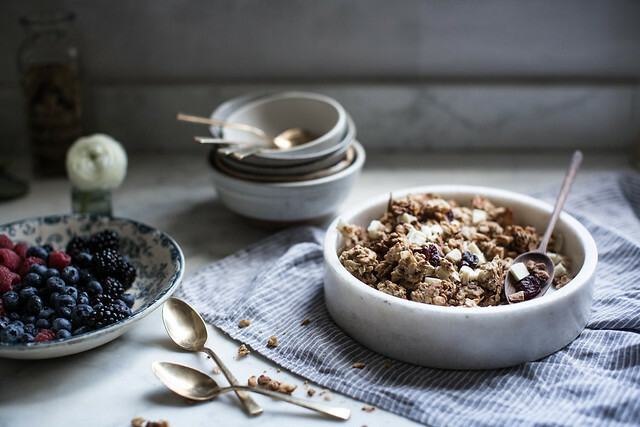 Oh how I would love to get up to such a bowl of indulgent granola. And I’m not even a big fan of white chocolate but adding cherries and coconut might be just my thing! 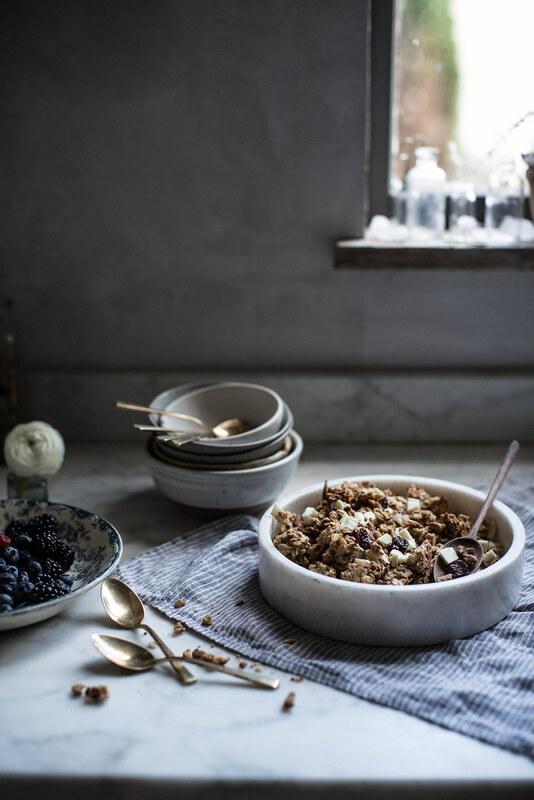 As a morning person I just love the routine of getting up early on the weekend to make an indulgent breakfast for everyone – so that’s just what I might do right now: extra clumpy granola ’cause that’s just the way it’s meant to be! This granola would get me out of bed in the morning, too. The white chocolate. Ah. What a great idea. I am soooo not a morning person, your photos are tempting enough to make me want to try to be! 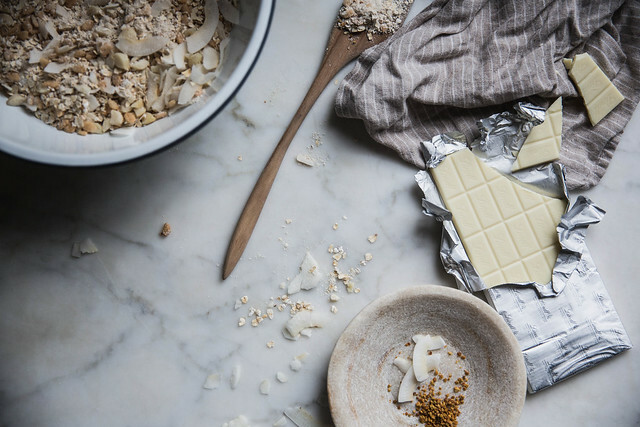 I also am not a fan of white chocolate, but I think you found a balance of flavours and textures that would really enhance it…. but I wish I was waking up to a room like the one in your pics! That’s some good clumping!! Definitely trying this on a Sunday. I’m one of those booooooring people who has the same breakfast EVERY SINGLE DAY. Milk and coffe – and I always think of you and your husband now, whenever I have my brekkie, because, well, milk and coffee, right? – and bread and butter. 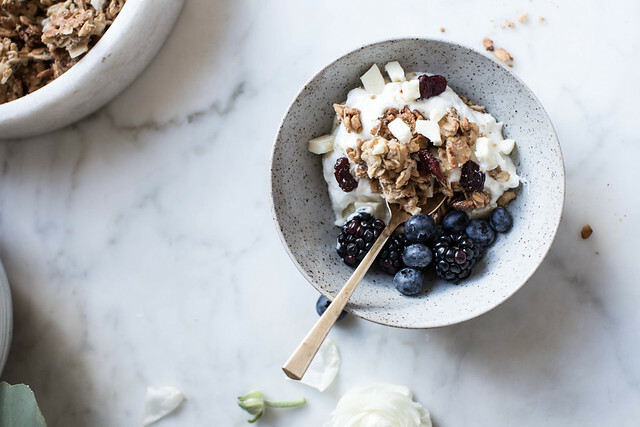 I love the whole idea of granola, I especially love the idea of it with yogurt, sadly my stomach hates even the thought of it. I have given it try after try and always end up feeling nauseated and vomiting my breakfast if I do not stick to bread and butter coffee and milk. I found out that if I have granola with milk at night, I don’t get sick, but I do get fat, so I had to stay clear of the whole thing… and yeah, granola without the clumps is just muesli and muesli is for making bread!! 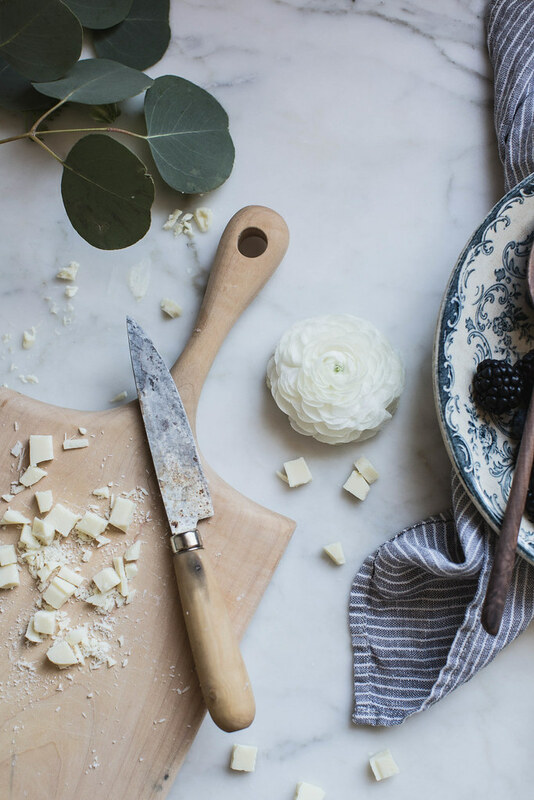 I really love love white chocolate, what a great recipe ! I agree with you- granola without clumps is just muesli. Not that there’s anything wrong with muesli- it’s just not granola. For maximum clumping, I turn my granola at the fifteen minute mark, then continue to bake it for an extra half hour. I then let it cool completely before breaking it into pieces. That results in clumps that are just the right size. This sounds so good! When you say rice puffs, do you mean the cereal that looks like rice cake pieces or rice crispies? I haven’t always had luck with clumpadge so I want to use the right thing. Also, out of the sweeteners you’ve listed which do you prefer? I normally use maple syrup but I think I’ve overdone it and want to try something different. Thank you! I mean hippie rice crispies : ) And I like a combo of sugar or light brown sugar and either sorghum or honey. 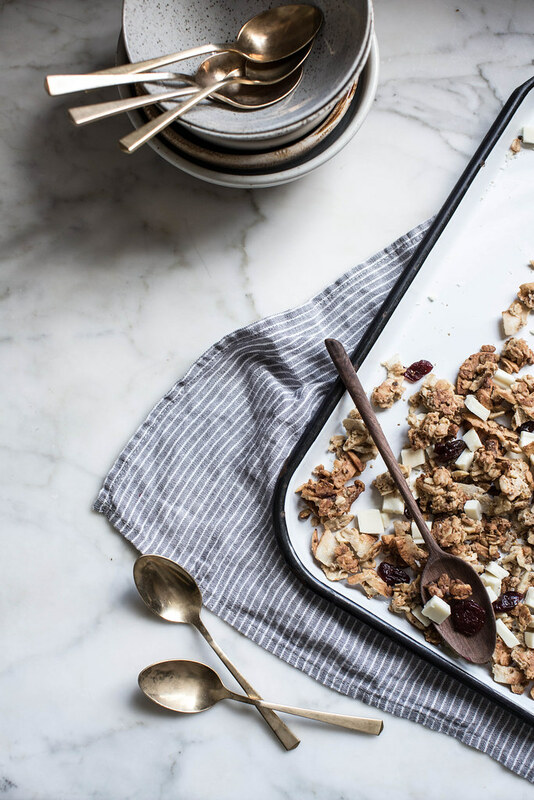 The granola looks amazing, but I can’t stop looking at the cereal spoons! Where can I get those? This sounds perfect. White chocolate and cherries are a perfect pair. I used to eat much more granola in the past, but I try to swap it for muesli, since it has less sugar. But it’s a really hard thing to do, especially when you see all these delicious recipes for homemade stuff. This looks soo delicous and beautiful! BETHHHHH!!! FINALLLYYYY!!! YOUR famous GRANOLA on the Internet where I can reference it any time I need to make it. Which is definitely now, and possibly every week for the rest of my life. People, it is the best granola you have ever tasted so please don’t hesitate…trust me…. Made it last night and it turned out great. Had to throw out the last one I made and was hesitant to make some since. Having a recipe to stick to helped, I think. This is so, so good! And has the perfect crunchy, clumpy consistence. Thanks for sharing! wow that looks so scrumptious! it is great idea. I’ll give it a try. I’m sure my kids will like it so much. Praise Be from Down Under! – this sounds wonderful! Pardon my ignorance, but what could you use instead of bee pollen? And could you use butter (how much) instead of coconut oil?